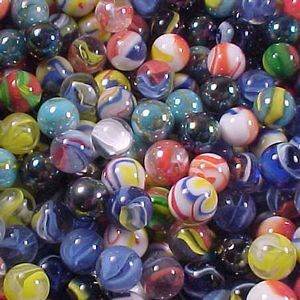 This Post Is Only About Marbles. When I was a kid, my brothers and I had one of the best toys ever invented. It was a brightly-colored plastic marble run kit. We just called it “marble madness” (but we didn’t know about the video game). We had a huge bag of marbles, and we spent a good amount of time building the most fun marble mazes that we could possibly come up with! We would plan contests to guess which foot piece would hold the most marbles by the time the run was over. Or, each of us would build a run off the same beginning track, and see who got the most marbles by the end. Our marble runs always began with the funnel piece, for maximum random distribution of marbles and thus maximum fairness. My favorite thing to do was to put a bunch of straight runs together one below the other. The marbles would zip right down them, one after the other, and get to the bottom almost immediately. My least favorite was the peg maze. (The one in the video is red. It is also behind a cat. Our peg maze was blue, and was never behind a cat.) The marbles would always slow down as they navigated the pegs. And if you poured enough marbles into the marble run, they’d start backing up behind the peg maze. Sometimes it backed up so far that the traffic jam would block my track completely and send all the marbles down my brothers’ tracks! So not cool! The contents of this site, such as text, graphics, images, and other material contained on. . .
That’s it? That’s your post? Um, yeah. Read the title. It’s only about marbles. On a blog whose subtitle is “A Writer’s Guide to Diseases and Injuries, and How to Use Them Effectively in Fiction”. A subtitle, which, by the way, is completely and utterly clunky and inelegant. You went to all the trouble cobbling together a clunky, inelegant subtitle for your blog, and then you write a post about marbles. It has nothing to do with diseases. Or injuries. Or how to use them effectively in fiction. Seriously? After all we’ve been thorough together? Um, ESPECIALLY after all we’ve been through together. So what was this post really about? Only marbles! I swear! Read the title! If it’s about anything other than marbles, you owe me an upside-down recitation of Jabberwocky. Fine. You have a deal. I have a feeling we’re going to get an upside-down recitation of Jabberwocky on this blog in the near future. Dude. The post is about MARBLES! ONLY MARBLES! Methinks Dr. Grasshopper doth protest too much. What think you, friends? Is there a specific reason you chose a video in Russian? Naw, I just pawed through a bunch of videos of marble runs and this was my favorite. Especially because of that peg maze. I agree with the guy in bold. I think this is a post about the circulatory system, or maybe nutrient storage and retention in cells. Anyway, I’d never write about stuff like that on my blog. That’s just crazy talk. See, here I thought that it was secretly a post about ion channels. Just look at that picture! Curses! Out-clevered on my own blog! I had one of those sets when I was a kid — lots of fun. For us, anyway. I suspect its eventual disappearance had something to with the constant “clank! clank! clank!” noises from the marbles hitting the plastic. Heh, we had a rec room that was above the garage, far enough away that the noise didn’t cause too many problems. I thought my parents were calling it the “wrecked room”, because it was really messy all the time. Then I learned the word “recreation”, and it all made sense.